In case you hadn't noticed we are a little conservative when it comes to our kids and electronics, gaming, phones, and all that jazz. Our kids do not have cell phones, personal iPad's, personal computers, TV's in their rooms, or unlimited access to such devices. When it comes to all that they are strictly monitored and limited. However as my kids have grown older they have been requesting more access. Also I can see the good things this technology can bring to them. Like reading, and learning, and math skills. Access to up to date information and learning problem solving skills and how to research. I feel this has lead Matt and I down a tug a war of parenting, how to let out the reins but still guard, their hearts, eyes, and minds. We tried getting the kids iPod touches last year. They have been OK. But we found we still had to watch closely what they were doing. We still couldn't allow them in their rooms and once again it was a fight or battle. Then this Christmas, enter in the Kindle Fire HD. We have a couple old (as in original kindles) but hadn't ever upgraded to this new technology. We use the kindle reader on all our I Pads and phones and love it. Then I heard about the FreeTime app. I read about it and decide what the heck, let's try it. 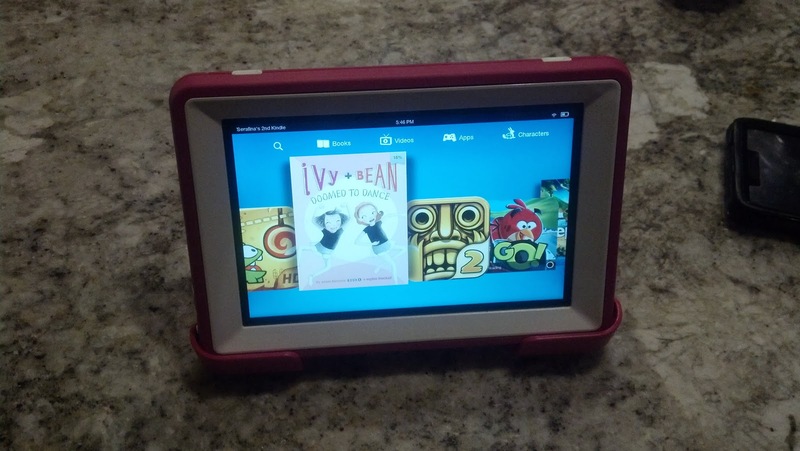 My parents bought the kids two Kindle Fire HD's for Christmas and the kids (mainly the older 3) where so excited! Matt and I setup the FreeTime app and I was immediately impressed by the app. 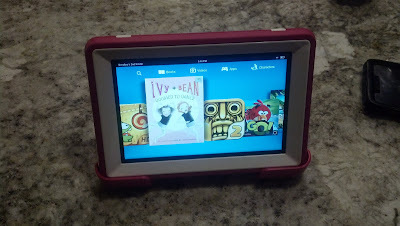 I didn't spend much time looking at all it offered as the kids were excited to get the kindle in their hands, but what impressed me off the bat was I could setup different accounts for each child (all of which can be accessed on any of the two kindles because they are all under my one account), and that once a child is in the app they literally can not access anything but the programs I have selected, nor can they exit the FreeTime app with out my password. Even if you turn the kindle off and back on again. So we handed the Kindles over and the kids were off. They enjoyed playing games, reading books and watching shows (hey it was Christmas). Finally, when they were all off in bed it was my chance to really dive in a learn more about FreeTime, and what I found made me as giddy as a school girl. This is the interface that my kids see. It works just like that of the Kindle Fire but they only have access to the content I choose (see I am not a horribly mean mom, they have Temple Run and Angry Birds). Also, when they are in FreeTime, your GPS location and ads get turned off in all apps. AWESOME! They literally can not get out of this without a password. Its like full lock down. Trust me I tried. A lot. No getting out. Here is the parental control center. You can see all the kids accounts, and how many items (ie -apps, books, shows) each kid has access to and who has timers and goals set. This FreeTime app not only does everything I mentioned above but I can set up time limits on every category. There are basically three categories, Reading, Apps, and Movies. 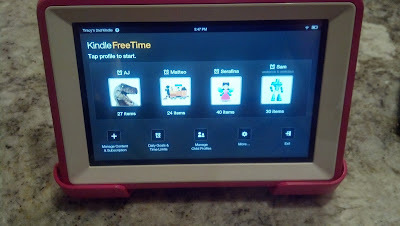 I can setup up the program so the kids can have unlimited access to everything or I can limit it all by having the Kindle shut off after a certain amount of time. But it gets even better then that. You can limit just one or the other. For example, you can allow 30 minutes of Apps, 45 minutes of Movies and unlimited Reading. WHAT!!! That is awesome. From there I found you can also have unlimited reading but setup the program to turn off at 9:30 pm so your kid doesn't stay up all night reading. So at this point I was pretty sure I had died and gone to heaven. I had spent 'God knows how many hours' trying to find a program like this for the Ipad to no avail and here it finally is on the kindle..why had I waited so long. And then I found the holy grail. You can setup up reading goals. As in, the program will lock your kids out of Apps and Movies until then Read X amount of time. WHAT?!?! It's as easy as that and I personally don't have to monitor it?!?! The app does it for me?!? Sign me up and count me in. You can also set it so they have to play X amount of educational apps before they can play say angry birds. I immediately setup this bad boy feature up. Thirty minutes of reading a day before you can access anything else!! And you know what?!?! My daughter woke up this morning and said I think I am going to read this morning!! LOVE IT. Also you can setup up different time limits and goals for the weekdays vs the weekend!!! It hasn't stopped there. When all of them run out of app and movie time...they READ...even Matteo, he has Bob books and other beginning reading/picture books on his account. Did I mention, I control what each kid has access to and each kid can have different times/goals/and content. So Matteo doesn't have all of Sam's books in his account and Sam can't spent 30 minutes reading Bob books!! Basically I am ready to by 4 more Kindle Fire HD's so all my kids have their own personal one and I have NEVER felt that way about any other electronic product and it is all because of this app. Thank you to the makers of Kindle and Kindle FreeTime for finally getting it and getting it right. I couldn't be happier. 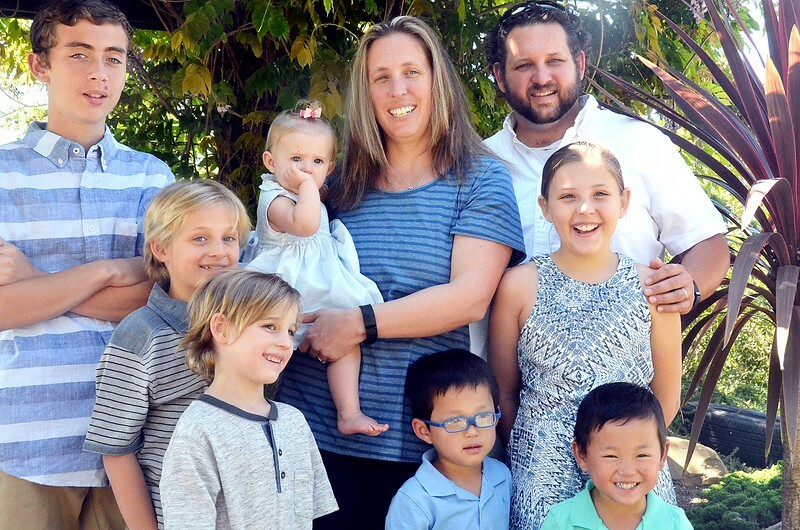 I felt like I need to share this with the world, because I know their are other parents out there trying to balance technology and raising kids who stay innocent just a little longer. This is a beautiful combination of both and it motivates reading and who can argue with that! !